Swim with ancient creatures in the watery depths and meet their modern-day descendants. 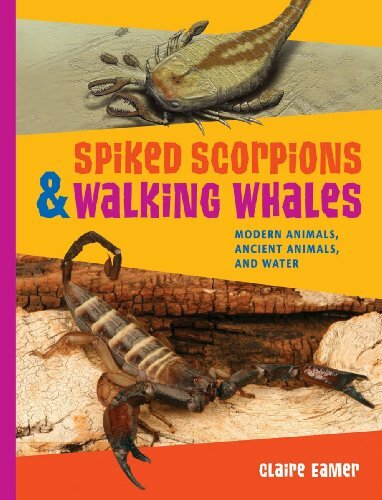 Following in the steps of the acclaimed Super Crocs & Monster Wings, this highly engaging book looks at how many modern day animals came from the sea. From 112-million-year-old platypuses to sea scorpions as large as crocodiles, readers will discover the ancient counterparts of creatures that reside on Earth today. Like so much of life, scorpions first flourished in the oceans but now exist in every land habitat, from rain forest to desert. As for the extraordinary platypus, it managed to survive the disaster that destroyed the dinosaurs and thrives today, exhibiting physical features of mammals, reptiles and birds. Polychaetes (segmented worms) Cephalods (mollusks, including the vampire squid) Scorpions Platypuses Whales Demon Ducks (giant birds with suitcase-sized beaks). Engaging between-chapter spreads on related topics and amazing fun facts complement each section. This fully illustrated dip into the watery world will prove as fascinating as a stroll with a walking whale.